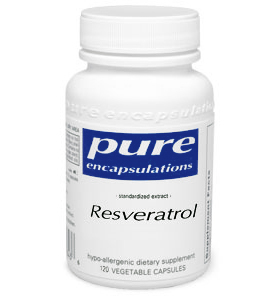 Resveratrol is a natural compound found in the skin of red grapes and hence in red wine. It may radically reduce the risk not only of heart disease but also of age related illnesses such as Alzheimer's disease according to recent studies conducted at both Harvard Medical School and the Institute of Genetics and Molecular Biology. This high potency, all-natural supplement provides high levels of one of the most powerful naturally occurring anti-oxidants. Resveratrol also has powerful heart protection properties. It promotes cardiovascular health through its antioxidant action and its ability to maintain healthy platelet function and arachidonic (an omega-6 fatty acid) acid metabolism. More recent studies suggest that resveratrol promotes cell health by maintaining healthy enzyme function and scavenging free radicals. It might also counter the effects of a high-fat diet and even prolong life by slowing the shortening of telomeres. A telomere is a region of repetitive DNA at the ends of chromosomes. As it shortens, cell life is shortened. 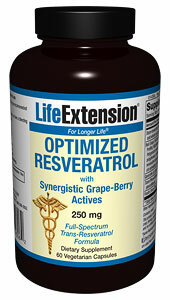 Resveratrol has been found to significantly increase the number of mitochondria in muscle cells. Mitochondria are responsible for generating your cells' energy. The increased mitochondria allow the body to burn more calories and helps prevent weight gain. Resveratrol has been shown to lubricate the blood making it less prone to clotting. It also relaxes blood vessels allowing the blood to flow more freely. People who have had a heart attack should know that Resveratrol actually protects the heart from damage by releasing a protective compound called "adenosine". Adenosine actually protects the heart from damage by aiding in regulating it's rhythm. Doctors prescribe synthetic adenosine for patients who have arrhythmia. It has been recently observed by Spanish physiologists that Resveratrol accumulates at very high levels in the gut. This makes it an ideal agent for colon cancer prevention. Human colorectal cancer cell cultures were treated by the physiologists with Resveratrol and they found that not only does it suppress cell proliferation, Resveratrol also activates caspase-3 the so-called ?cancer-executioner protein?. Confirmed by microscopic examination, caspase-3 launches cell destruction without inflicting cellular damage to normal human tissue. Cellular damage is a common and debilitating result of conventional chemotherapy. Further confirming resveratrol?s role in cancer cell death, researchers in Austria demonstrated that by neutralizing the enzymes needed to copy their genetic material, resveratrol blocked the reproductive cycle in colon cancer cells. In another recent test tube study, Resveratrol was found to increase the production of an enzyme that destroys dangerous estrogen metabolites. Scientists believe this function could stop the whole progression which leads to breast cancer. Such a finding is dramatic because the study was done with fairly low concentrations of Resveratrol. Along with the supplement Curcumin resveratrol is one of the most promising natural cancer prevention agents known to modern science. One recent study revealed that resveratrol at higher doses teams up with a commonly used chemotherapy drug called 5-fluorouracil to kill cancer cells synergistically.